The D.I. Mendeleev All-Russian Institute for Metrology (VNIIM) is the successor of the Main Chamber of Measures and Weights which was the first in Russia and one of the oldest in the world among metrological institutions. Today, VNIIM is one of the largest world centers of scientific and practical metrology. It is the leading Russian organization in the field of precise measurements in metrology and the major centre of national measurement standards in Russia. VNIIM works under the auspices of the Federal Agency of Technical Regulation and Metrology. In July 1994 VNIIM was conferred the status of a National Scientific Centre of the Russian Federation. As a Russian National Scientific Centre VNIIM is supervised by the Ministry of Education and Science and is a member of the Association of National Scientific Centers. In June 2005 the auditors and technical experts of COOMET (the Euro-Asian Organization on Cooperation of Metrology Institutes) from Slovakia, Germany, Belarus and Ukraine conducted in VNIIM a Peer Review of the Quality Management System (QMS) for the compliance with ISO/IEC 17025 standards "General Requirements to the Competence of Testing and Calibration Laboratories". 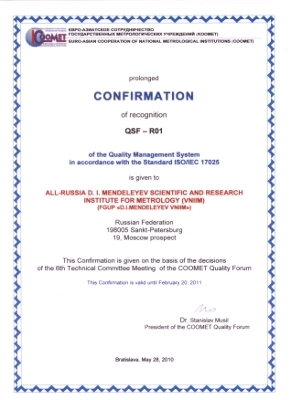 On the basis of the TC "QS-Forum" report the COOMET concluded that on the whole the quality system of VNIIM complies with the ISO/IEC 17025 requirements, and issued Recognition Certificate № QSF-R01 dated 28.05.2010. The major aim of the Institute is to ensure traceability within Russia and worldwide by improving the existing measurement standards and creatin new ones through basic and applied scientific research. There are 16 Doctors of Science and 90 Candidates of Science working in the Institute. There is also a Doctoral and Candidate’s Council authorized to confer doctor’s and candidate’s degrees. The D.I. Mendeleyev All-Russian Institute for Metrology (VNIIM) is the successor of the Depot of Measures and Weights, the first Russian metrological institution and one of the oldest in the world. 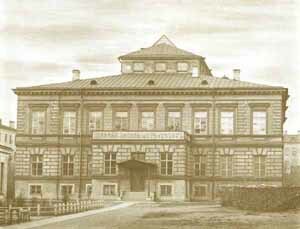 It was founded in St. Petersburg in 1842 and transformed in after years, first, into the Main Chamber of Measures and Weights, and later into the All-Union Research Institute for Metrology. On the January 10-th 1945, the Institute was named after D.I. Mendeleyev, eminent Russian scientist and founder of the scientific metrology. Today, VNIIM is among the largest world centers of scientific and practical metrology dealing with precise measurements and methods assuring their traceability to measurement standards, and the country's leading Institute carrying out fundamental research in metrology. It is also the main center of national measurement standards and the Head Office of the Russian Academy of Metrology. VNIIM incorporates scientific research departments and laboratories, design office and processing departments, international cooperation department, engineering, economic planning and financial administration, external economic relations and marketing department. A separate structural unit of the Institute is the Lomonosov division comprising a number of research laboratories. VNIIM has its own Academic Council and a special council for upholding doctoral theses. The VNIIM’s scientific and technical library is one of those libraries that own collections of books and journals of great scientific and cultural value that have been formed since the 19th century. VNIIM is also famous for its Metrological Museum, the depository of metrological history exhibits: Russian and foreign measures and measuring devices. large hydrophysical basin with a "free submerged jet". high international standing in metrological studies, scientific and commercial reliability confirmed by the awards to the Institute by the Trade Leaders Club and the Global Quality Management Ltd.